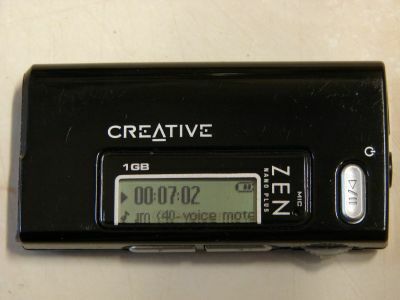 The Creative Zen Nano Plus MP3 player (1 gigabyte, £43.20) comes in 10 colours and is available in 512MB of flash memory to store up to 250 tracks and 1GB of flash memory to store up to 500 tracks. The sound quality for MP3 is excellent and even better for WMA encoded tracks, the frequency response is 20Hz to 20,000Hz, with a signal-to-noise ratio of 90dB. Although plastic, the build quality is of a high standard with a durable scratch resistant casing. The device is controlled by 3 responsive and sensibly sized buttons: power on/off (which also acts as the play/pause); volume up; and volume down. The remaining functions are delivered via a scroll wheel which also has a rocker function and acts as the skip and the fast forward/back controls. All controls can be operated one handed by use of the thumb only. The black on green backlit 3cm x 1 cm LCD (18 characters) interface is a very intuitive and user-friendly display using 2 lines of text where each of the main12 functions is identified by an icon. The display orientation can be configured to allow reading whichever way up it is held (in any one of 16 languages!). There are 6 graphic equaliser settings - 5 preset ( Rock, Jazz; Classical, Pop, and Normal) and Custom. The Custom setting allows manual configuration of a 5-band filter circuit for tonal characteristics of the mid-frequencies. Tracks can be placed in memory singularly or in folders as whole albums. There are 12 play modes - play all tracks / single track / single folder / all folders; either in order or randomly; and even play once, repeat once, repeat continually.. The device is powered by one AAA battery which routinely provides approximately 18-hours of playback time, microphone 15 hours and 9 hours of direct encoding. The supplied Energizer battery, however, lasted just over 24 hours. I prefer to use a pair of rechargeable batteries in tandem. The device is connected to the computer using a USB cable (series "A" plug to Mini-B receptacle on the device) and is recognised as a standard mass storage drive, powered by the computer when connected. There's a rubber cover over the USB port on the device. 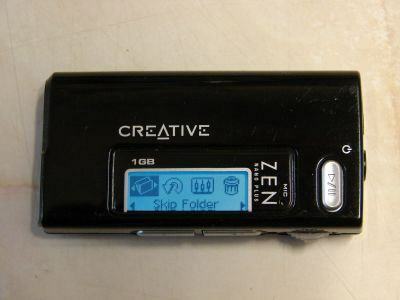 The computer drivers provide an extremely user friendly Drag-and-Drop style interface with USB 2.0 support, including DRM copy-protected music, allowing you to easily transfer music, even via a lowly USB 1.1 Windows 98 PC. The driver software is unnecessary for simple storage operations as it can be used a like any other flash device; however unlike some devices this does not have a type A connection so you need to have the interface cable with you. For 'CD quality'* playback a bit rate of 128Kbps is required which equates to 1 minute of music per megabyte, therefore the 1 gigabyte gives 8 hours worth of CD quality music which is about 200 songs. Encoding at 64Kbps allows 500 track advertised capacity. I have been using mine since the day I got it back in 05, I had the problem with it shitting off after a few months and I called the company. They gave me a web site to go to and hook my mp3 up to my computer an download something from the site on to my mp3 and I havn't had any problems since. This is the best thing music could have came out with lol. 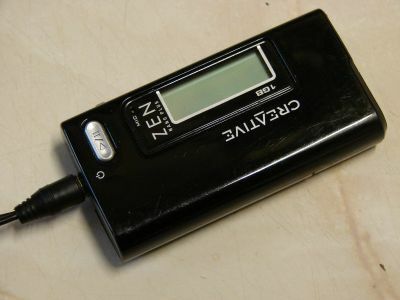 I got my Zen mp3 player at www.consumerdepot.com and it is a great mp3 player and the price was great too. I wouldn't reccommend buying this product. Apparently, there have been a lot of reports about it randomly shutting off after a few months. I am currently having the same problem. At least with the latest firmware, you can delete files on the Nano. Now if they only allowed FF or REW by seconds/minutes rather than by track. I have so many audio books and podcasts 30-70 minutes long. If the battery goes or I jog the wheel by accident, I can't get back to where I was, or if I want to rehear the last minute or two, I can't. I've used mine for several months now, listening 5-15 hours per day. A wonderful little thing. I’ve just had an email from a user of the 512MB version of this device, it doesn’t seem to come with the line in cable, so warning, direct encoding requires a non-standard adaptor (3.5mm to 2.5mm Mono plug to plug lead). wow "CAM" you need a life mate and to SHUT UP...what the hell is your problem this guy goes out of his way to do an excellent review and all you can do is freaking moron about it, while looking like a prat. We would all love studio sound, but for a player this small I think it’s better than my computer and CD player, even at 92kbps. I’ve sent a few amendments to help clarify the issue of ‘CD quality’ (thanks for the input belos) this was not intended to be confused with a technical debate. I’m not interested in the sound the industry as a whole and everyone I asked agreed that 128kbps was an acceptable analogy for ‘CD quality’ with regards to an MP3 player. Standard Windows media player encodes at a maximum of 192kbps. This device directly encodes at a maximum of 160kbps, I don’t see or hear the problem. If we are going to get picky, there is no point making a comparison betweens MP3 and standard CD level encoding, the important point is that MP3 is still the winner format in popularity and support and at an average bitrate of 128kbps despite the know signal issues. The end result depends on factors other than that actual being encoded. Some songs can encode well at lower bitrates and will still sound fine, while other songs might sound bad at similar or higher bitrates. I agree, 128Kbps isn't really CD quality. It depends a bit from person to person but personally I'm pretty satisfied with 192Kbps (or higher) songs. "For CD quality playback a bit rate of 128Kbps is required"
I don't think so. 128Kbps is WOEFUL in terms of qaulity. Audio artifacts can be heard by even the most uncultured ears. CD wuality is WAV PCM. No ifs. No buts. Please in future, check your figures before you contribute articles. It inly goes to show a lack of dedication, interest, and knowledge to both the product, and the industry as a whole.